Make a super contemporary desk, all you need to do is stack four cinder blocks on each side, then sit a piece of wood over top of them. This desk idea is great because you can easily customize it to the size of your room. You don’t need to spend tons of money on an outdoor seating area when you can easily make your own! Click here for the full video tutorial on how to make this stunning cinder block bench. Click here for the instructions on how to make this simple and inexpensive project. Decorating possibilities that exist with this simple cinder block display. Arrange tea lights and gourds for Halloween, and greenery and pinecones around Christmastime. By stacking a couple columns of cinder blocks and fastening a piece of wood to the top, you can have yourself your very own patio bar. Paint the cinder blocks (like they did here) for an extra polished look. 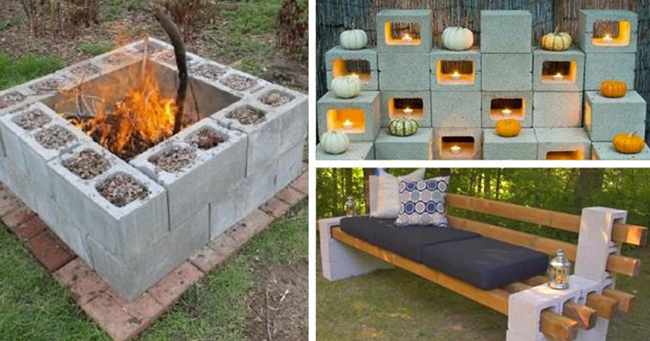 If you’re looking to make your outdoor space easier to navigate, why not build some cinder block stairs? Click here to learn more about this great project. DIY cinder block vase? You could paint them in whatever patterns and colors you like, and they are extremely simple to make. Click here for the list of instructions. If you’re looking for some modern and funky end tables for your bedroom, all you need to do is stack a few cinder blocks. They look amazing, and they also feature tons of storage space.